The Electoral Commission was passed a copy on January 14th 2015 of the Labour Party’s legal advice arguing that the counting of votes at postal vote openings was legal. This is confirmed in the following internal email from Bob Posner, the Commission’s Director of Party and Election Finance and Legal Counsel. 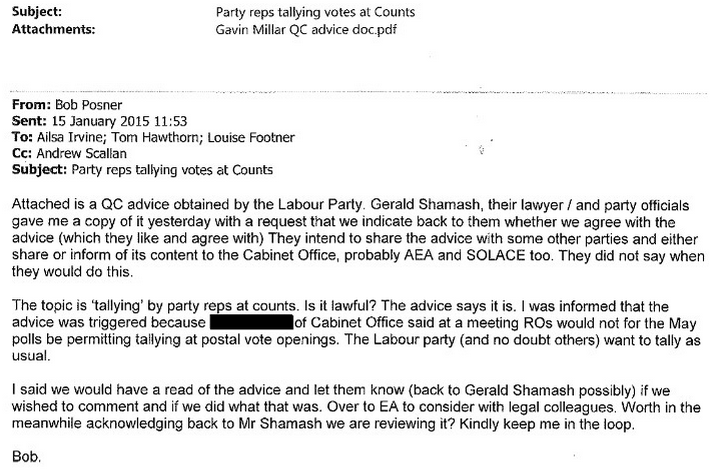 The comment in the email that “The Labour Party (and no doubt others) want to tally as usual“ implies that the Electoral Commission were aware that the counting of votes at postal vote openings was an established practice. As far as I am aware the Commission did not respond to this advice until the Labour Party brought it up at the Parliamentary Parties Panel in March.